What a privilege it is to serve the church! 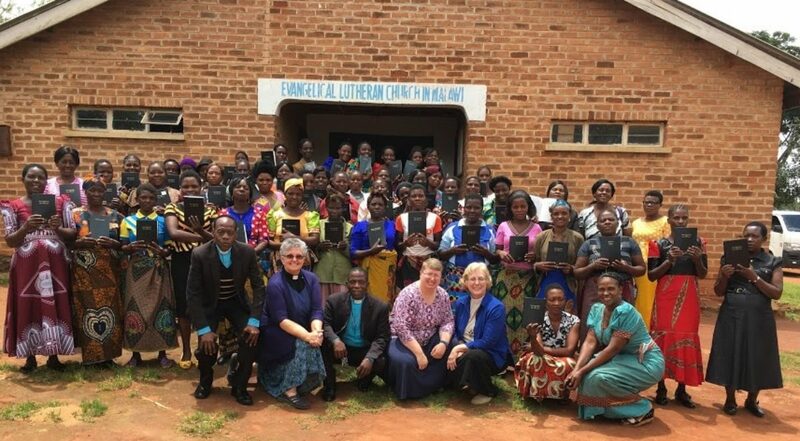 In January, a team of three theologians traveled to Malawi, the “warm heart of Africa,” for two weeks to train about 120 women of the Evangelical Lutheran Church in Malawi (ELCM). The team consisted of Pastor Cathi Braasch, Pastor Pam Thorson, and Mrs. Mari Dew. ELCM Bishop Joseph Paul Bvumbwe, in agreement with NALC Bishop John Bradosky, invited NALC women theologians to come and train Christian women leaders in the doctrines of the faith from an orthodox Lutheran perspective. Because ELCM does not have enough pastors to preach and teach in all of its congregations, lay people, including women, provide preaching and teaching. The ELCM does not ordain women, but church leaders have expressed desire to begin that process. Awakening Lives to World Mission (ALWM) made all the arrangements for the training event. While ALWM has sent mission teams to Malawi in the past, this is the first team from the NALC to work with the ELCM. Thank you, ALWM, for arranging an amazing mission. We had a tremendous time with our Lutheran sisters and brothers in Malawi. Our host for the two weeks was the Rev. Feston Phiri, the Executive Director of Education for the ELCM, who accompanied us, serving as director, guide and interpreter. We traveled from Lilongwe in the central part of Malawi to the Mzuzu Deanery in the north with our driver Derrick, John Phiri, the DAAA (Financial Officer), Rev. Phiri, and Agness Ndalama, women’s coordinator for the ELCM. We were well cared for, being treated as honored guests and welcomed as friends. Our new friends helped us learn some phrases in Chichewa, the nationally common language. Rev. Phiri’s wife, Lydia, accompanied us the second half of the journey and so we were able to meet most of their family. After a long drive to the Mzuzu Deanery, we were met by a tremendous group of women singing and dancing their welcome. Even though we were tired, their joy and enthusiasm were energizing. The Rev. Dean Chimwaye and his wife, Amai Dean (which means “wife of the dean”) Martha, welcomed us to their home. They apologized for having no electricity, but candles sufficed, and their hospitality was most welcomed. We became accustomed to the regular, but random, power and water shutdowns. The next week our reception was similar in the Blantyre Deanery where we were hosted by the Rev. Dean Pearson Banda and Amai Dean Olipa. We made good friends and colleagues throughout our trip. On our first Sunday in Malawi, we attended worship at the Deanery Parish church in Mzuzu. Pastor Cathi preached according to the Old Testament lesson assigned by the Evangelical Lutheran Church in Tanzania, as appointed in the Revised Common Lectionary. The worship was similar to our own liturgical sense. The next Sunday we attended the cathedral church in Lilongwe, and Pastor Pam preached. It was a service of Holy Communion, which is celebrated once a month. They observe a great reverence which is sometimes lacking in our American congregations. Their many lively choirs add a truly African dimension unlike most of our own Lutheran services. Rev. Phiri explained that they use the choirs as part of their evangelism efforts, inviting young people to join a choir. This has proven to be a successful means of church growth. It is true that Africans love to sing and dance. The conference in Mzuzu had 57 women from the three northern Deaneries. At our second conference, in southern Blantyre Deanery, 52 women participated from three Deaneries. Had we more time, we may have been able to teach other women in the central three Deaneries. These are all spiritually mature Christian women, most of whom are in leadership in local parishes or on the staff of the Deaneries. The group included Bible study leaders, teachers, prominent women in their communities, and also young women. At each conference, we began by giving out Bibles in the tribal languages, with most receiving one in Chichewa. These were met with great excitement since most did not have a Bible and the ones we did see were torn and worn. We give thanks to our donor who gave a special memorial gift. Our task was to provide solid, orthodox Lutheran, in-depth teaching on the basic doctrines of the faith and to encourage women in leadership. Topics included the Trinity, the Sacraments, the Ten Commandments, God’s amazing grace, obstacles in our lives to receiving God’s grace, prayer, Christian marriage, women in Scripture, and the gifts of the Holy Spirit. The women were thoroughly engaged in every session, taking notes and looking up every Bible reference. In the beginning, they were hesitant to ask questions, but they began to warm up as we made some connections to our own personal lives. Cathi led a time of braiding prayer necklaces as a reminder of their conferences. Each member of the team contributed equally with their own gifts and understanding. This kind of teamwork makes for a good mix of teaching methods to suit different learning styles and personalities. Women of the Bible were featured, but not exclusively. They were pleased to have women teach them in a balanced way that honored family and home, as well as leadership. We modeled different styles of Bible study so they could learn to lead in their own context with more confidence and expertise. It was especially wonderful to have a number of young mothers with their babies and toddlers at the conference in Blantyre. They take their babies everywhere with them. We asked how they tied them to their backs and with delight they showed us by personal demonstration. They use a chintenje, a piece of colorful cloth wrapped around like a skirt or around their backs, to tie the baby around them so they can work. A chintenje was given to each of us at the end of each conference. The women were excited to wrap us in them and show them off. ELCM leadership expressed great satisfaction with our training, style, approach, and content. They trusted us to teach whatever we could. We sought to teach, but not to lead them. The ELCM will decide what to do with anything we taught. They have been accustomed to other church bodies coming in with directions and expectations. Our team simply set out to teach sound, biblical and Lutheran teaching. The ELCM is orthodox in theology and practice, which would make for a good partner in ministry with the NALC. We all share hope for more training opportunities and relationship in the future. As a team, we were blessed and humbled. Malawi is a poor country, but the people are warm hearted and kind. We leave part of our hearts with our friends in Africa, even as we take much of Africa with us. God provided for every need, leaving no gaps in covering expenses. We have much to learn from our African partners, recognizing that we can give out of what we have been given in sound teaching. God is so good.